I have a thing for durable watches. Finding a watch that can stand up to an active lifestyle, and still look good and keep great time over the period of many years, is surprisingly difficult. If you want a really robust watch, the conventional wisdom is to go with a Casio G-Shock if you’re looking for a quartz or digital solution, and a Rolex if you want something Swiss and high-end. 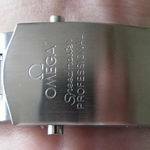 But Omega fans know there’s another option which has one of the most interesting backstories in the history of horology. 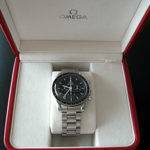 The Omega Speedmaster Professional lands squarely between a high-end G-Shock and sport model Rolex in terms of price, looks fantastic, and has stood up to some of the most rigorous testing that any watch has ever been subjected to. 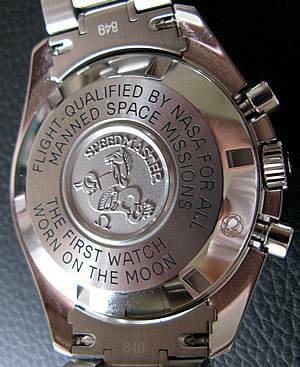 Not only have Speedmaster Pros gone into space on many occasions, but they have actually been worn outside a space suit on the surface of the moon. 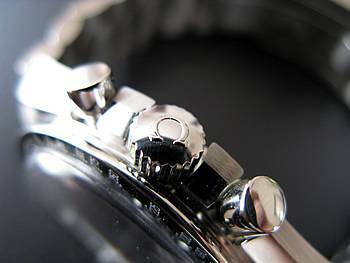 Legendary Speedmaster bracelet with push-button release. 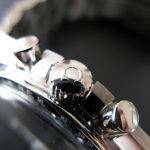 Caliber 1861 manual wind movement; rhodium plated for corrosion resistance; 48-hour power reserve. Hesalite crystal (a type of plastic similar to Plexiglass — very shock resistant). Water resistant to 50 meters, or 167 feet. Chronograph function (with “small seconds” at the 9 o’clock position), and tachymeter. As you can see, the Omega Speedmaster Professional isn’t a fancy watch in terms of complications and features. It has to be wound manually, it doesn’t have a date display, I wouldn’t get it wet beyond a shower, and the crystal is relatively easily scratched. 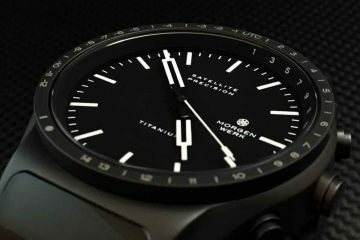 But what it does have is a combination of simplicity, build quality, and well chosen materials that make it one of the most robust and interesting watches currently on the market. Let’s take a closer look. This was my first experience with the legendary “Speedy” bracelet, and I’m hooked. I’ve handled a lot of stainless steel bracelets over the years, but I’m pretty sure this is my favorite. It’s solid, perfectly machined and built, and completely silent (no squeaks). While it’s robust, it’s not so massive as to be a burden or feel like an anchor. 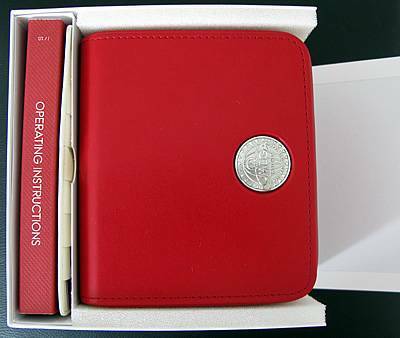 The clasp design is simple and elegant, and the polished strips that cap the center links give it just a touch of class. Yes, the movement has to be wound manually, and no, there’s no date or day or moon phase or GMT hand, but there’s something to be said for a simple design in terms of robustness. The Lemania 1861 movement has changed very little over the history of the Speedmaster, and for good reason. If it ain’t broke, don’t fix it. It is now rhodium plated (which is the difference between the 861 movement, and the 1861 movement) for additional corrosion resistance, but that’s about it. So how does it perform by today’s standards? 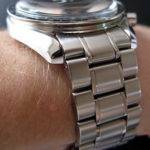 Mine is about 1.5 seconds fast per day — as good or better than any other mechanical watch I’ve ever owned, including many that cost far more. Now that practically scratch-proof synthetic sapphire is the standard in high-end watches, why would anyone want a throwback to the days of plastic? Two reasons. The first is simple aesthetics. Although sapphire is far more scratch resistant, some people simply prefer the look of the Hesalite (it tends to have a look which is more functional than classy, in my opinion). 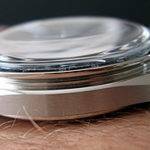 And the second is that although sapphire is very scratch-resistant, it breaks relatively easily. What do I mean by “easily?” Well, don’t drop a watch with a sapphire crystal on a tile floor, and if you’re going to be swinging your arm around with any velocity, make sure there’s no chance your watch might hit anything of any substance. While the Hesalite crystal is certain to pick up minor scratch over the years, there’s not a lot you can do to it to actually break it. The other advantage to the Hesalite is that it’s very easily polished if the scratches start to bother you, and relatively inexpensively replaced if you really gouge it. Now that your typical Casio G-Shock is water resistant down to 200 meters (about 660 feet) and most of the big Swiss brands have watches with screw-down crowns that are rated to 300 meters (about 1,000 feet), 600 meters (about 2,000 feet) and even 1,220 meters (4,000 feet), why would you settle for a mere 50 meters, or 167 feet? Primarily because 50 meters if perfectly sufficient for most of us. If you’re a diver or even a frequent swimmer and you don’t want to change your watch, the Speedmaster certainly isn’t for you. But if you just want to feel confident in a rain storm, rinse your watch off when it’s dirty, take the occasional shower with it on, or not have to worry about falling into a pool, then 50 meters is perfectly fine. 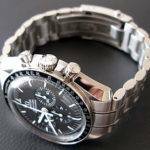 The Speedmaster has also demonstrated more than enough water resistance to function perfectly well in very humid conditions (more on this below). 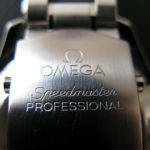 So what makes the Omega Speedmaster Professional such a legend? 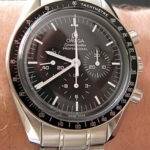 By now, most watch aficionados know that the Speedmaster was worn on the moon, but most don’t know the details behind the story. When the Speedmaster was introduced in 1957, Omega had no intention of sending it into space, but the combination of the chronograph and the fact that it is a manual-wind watch made it a great choice during some of the Mercury missions. 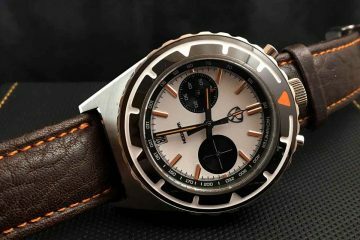 Astronauts needed a manual-wind watch since automatic (or “self-winding”) watches rely on a weighted rotor which doesn’t work well in zero gravity, and they needed a highly accurate chronograph for timing rocket firing sequences. 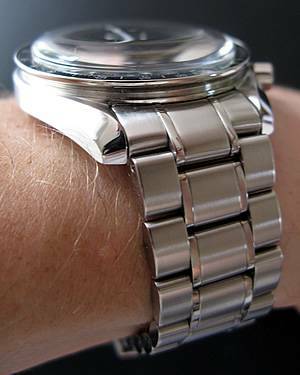 During the Mercury missions, astronauts could wear any watch they wanted, or even no watch at all, since watches were basically backups to the onboard clocks, but during the Gemini and Apollo programs — which involved EVAs (extravehicular activities) which needed to be timed — the right watch became far more important. In 1962, NASA began searching for a more official piece of timing equipment to be worn by Gemini and Apollo astronauts. 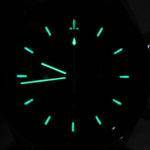 Several watches were purchased over-the-counter and subjected to rigorous testing including temperatures from 0° to 200° F, 12g’s of acceleration, extreme humidity, and a violent vibration test. Some of the Mercury astronauts’ instincts had been spot on: the Omega Speedmaster Professional was the only one to pass all of NASA’s tests. 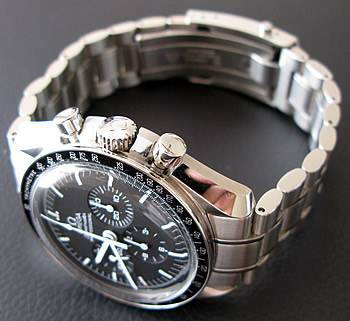 In 1965, the Speedmaster was declared the official watch of the US space program. 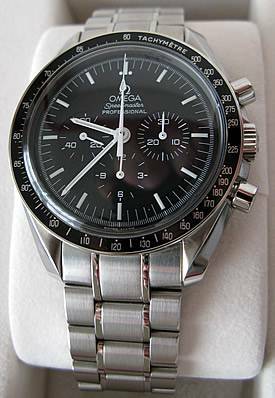 The Speedmaster was subsequently worn by Edward White on the first America spacewalk in 1965, Buzz Aldrin in 1969 during his and Neil Armstrong’s famous first lunar excursion, and it was used by James Lovell to time various burns during the ill-fated Apollo 13 flight since the onboard clocks were inoperable. 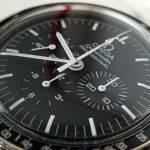 The Omega Speedmaster thus survived some of the most rigorous testing of any watch in the world as well as the harshest environments and conditions known to man, and even several political attacks by Bulova watch company who insisted that NASA should be using American technology rather than Swiss (the Bulova watches never passed all of NASA’s tests like the Speedmaster did). 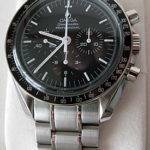 The Omega Speedmaster became such an important and recognizable icon of the space program that Buzz Aldrin’s Speedmaster — the first watch ever on the moon — was tragically stolen while being transfered along with other equipment to the Smithsonian for display. 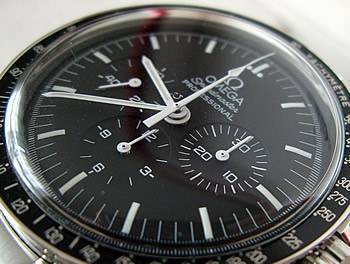 At this point, there are several versions of the Speedmaster available. 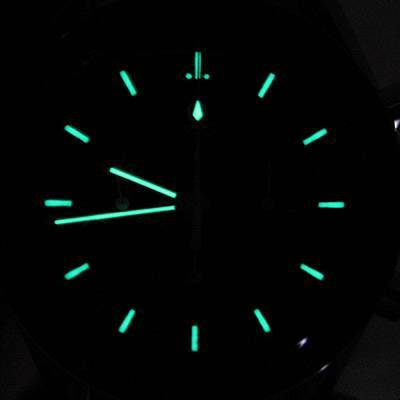 You can now get them with Co-Axial escapements, self-winding movements, sapphire crystals with anti-reflective coatings, date and day-date complications, display casebacks, 100 meters of water resistance, GMT functionality, and all kinds of variations in hand design, case and bracelet materials, dials, and straps. 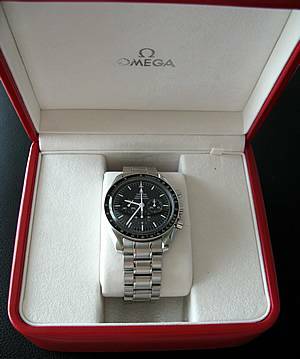 But Omega has continued to offer almost the exact same watch that was chosen by NASA in 1965 which I have now chosen as my first Omega all these years later. While there are at least eleven different Speedmasters available today, there is only one true moon watch. Very good article that covers all the usual points I’m interested in. While I don’t own one, I’ve been considering a purchase. But automatic or manual? Or broad arrow v co axial? 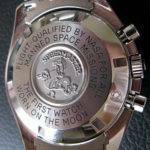 The Moon watch history and robustness sell me. Hope you chose the original, hand wind model, then when you show people or they comment you can tell them it is the Moon watch, anything else is just an updated copy that has nothing to do with the moon walk. 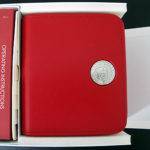 I own one and after this great article I am glad I bought it. Thanks for the update i did buy the manuel wind watch. Thank you a wonderful post. 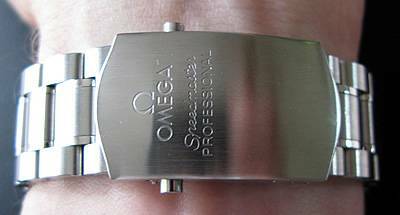 I currently own the Omega Planet Ocean XL, but I have the Moon Watch on the way. My problem is that I might find it difficult to wear any other watch. 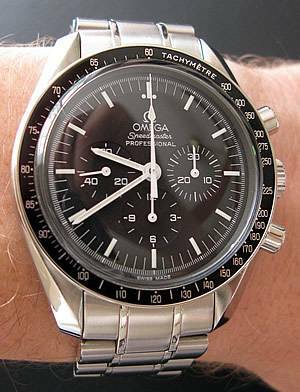 I too was sold on the history of the Speedmaster, and the fact that you must wind the watch daily only adds to the charm of owning such a special time piece. I grew up in the Sixties, and as a child I was completely fascinated with the space race, and my fascination continues into my adulthood. The Speedmaster is in many ways a link to that period of time and exploration. 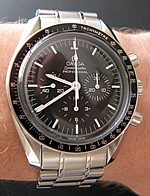 I am confident that when man returns to the Moon and later Mars, that the Speedmaster will traveling with them. I wear the 3570.50 as my daily wearer, I also have a seamaster Bond among others but the speedy pro is my favorite. Looks great in a suit or jeans, classy not showy.The only problem is here in Australia they now cost over $5000 but keep their value well and always will as they are always in demand and never go out of fashion. If you gonna go speedmaster go the O.G. moon watch either on steel or leather, both look good. I own the m.o.m 3570.50 and I think in my collection it is the best. Always get compliments when I wear it. Come on I couldn’t resist asking you guys to send this watch to us at SwissWatchMakers I mean just the name of it gives me chills “moonwatch”. Ok most I just ask for you guys to send it to us for repair and what not but this one I’m begging. http://www.Swisswatchland.com I’ll even put my number (305)-937-4637 please send in one :). Of course we can work on many other brands and styles. 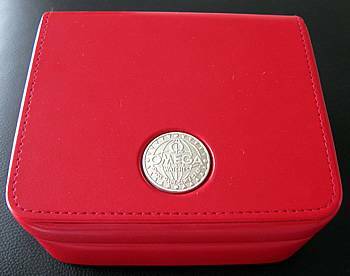 what is the price for brand new one ? mean it’s fake or can you buy them battery operated? might be passed from one generation to a different. i own one of these n use GLANOL Car Polish with Carnauba Wax to polish the Hesalite Crystal once in 6 months that keeps on increasing the Glossy Shine of the crystal. In my view, this Eternal Time Capsule has the ability to measure Time beyond the age of our Universe …………. As a Speedy owner there is no way yours is real. Mechanical or Automatic not quartz is the way they are produced. Some extreme Speedy owners do not consider Auto versions part of the “Moonwatch” group either. There are technical reasons why they are correct, but from a looks perspective there is no difference (auto or manual). 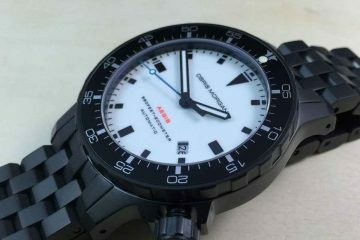 Another way to tell a fake is the sub-dial markers should appear to touch, and the second hand is @ the 9 marker. Only on the Reduced are they spread and that is a completely different movement and not a “Moon.” Not be crass but please throw yours out. Wearing fakes is a lie only to yourself. I love mine . I don’t think it is finished near as well as,any of my Rolex watches but still a great timepiece! I have King of Kings Rolex watches. Daytona PM, Sky-Dweller PM. And I can say I still wear the Moonwatch over them any day. Finishing or not. 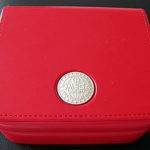 Too many people own a “Rolex”. It’s become too Chav-ish. Omega Moonwatch is Class. Rolex will be kept purely for appreciation purposes. Not many are tasteful enough to fully get to love the Moonwatch.